Editor’s Note: This is the third and final post in our series on honors program completion rates. In the first post, we wrote about the hybrid structure of honors programs and how that can affect honors completion rates. An honors completion rate is the percentage of honors students who complete all honors course requirements for at least one option by the time they graduate. The second post presented a tentative formula for evaluating honors completion rates. This post has two parts. The first part compares honors completion rates of main option and multiple option honors programs; the second part (2) a compares completion rates of honors colleges and honors programs. Main option programs emphasize only one curriculum completion path, usually requiring more than 30 honors credits and often an honors thesis as well. Multiple option programs offer two or more completion paths for first-year students. One option might require 24 honors credits; another might require 15-16 credits. Either of these might also require a thesis. Many universities are now establishing honors colleges. These usually have a dean and a designated staff of advisors. They typically provide at least enough honors housing space for first-year students. Some began as honors programs and then re-formed into honors colleges. Quite a few honors colleges have significant endowments. 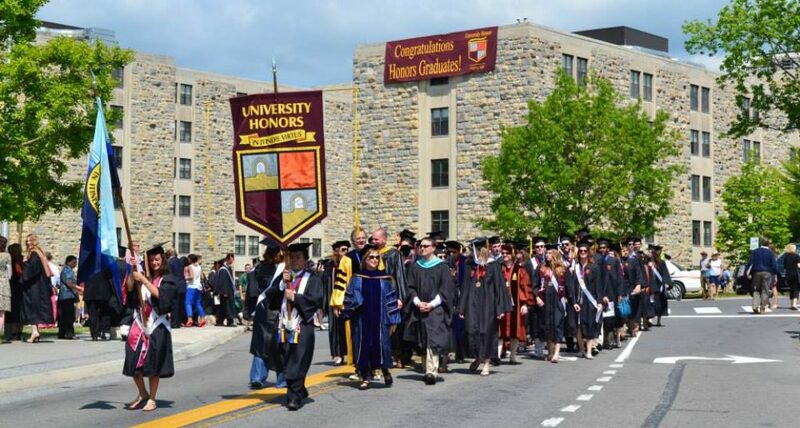 Honors programs do not have a dean, but are administered by a director and staff. Sometimes there are few real differences between honors colleges and programs. In general, however, honors colleges have more staff and offer more access to honors housing. We received data from 23 honors colleges and eight honors programs, having a combined enrollment of more than 64,000 honors students. The 31 parent universities had an average U.S. News ranking of 126, ranging from the low 50s to higher than 200. This entry was posted in Honors Curriculum, Honors Research, Honors Residence Halls, Stats and Surveys and tagged honors program rankings, honors program ratings, Honors Programs, public university honors colleges by Honorsadmin. Bookmark the permalink.